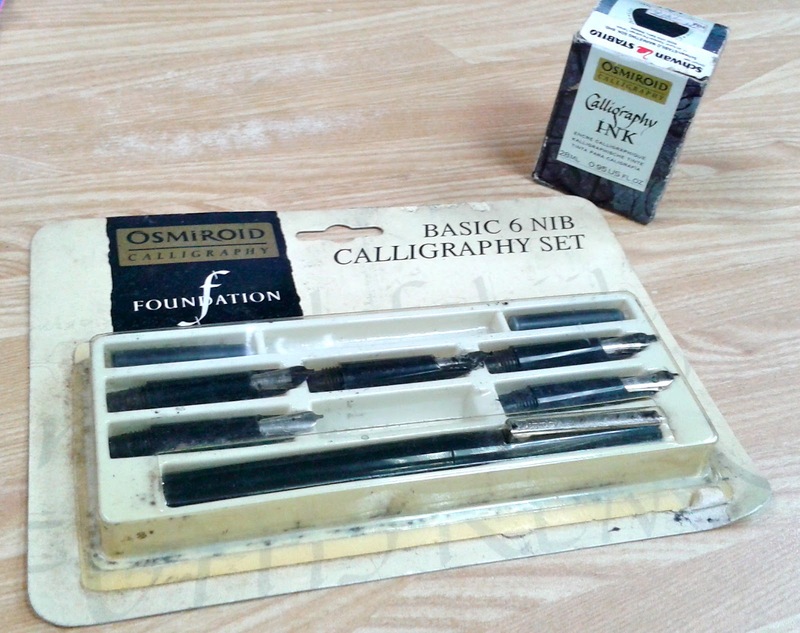 On 2 April I received an Osmiroid Calligraphy Set from a colleague. It happened like this: she took the tattered and dusty box of the 6-nib set from her bag and placed it on the table in front of me. I looked at her questioningly. She said, “Well since you like fountain pens and calligraphy, and since I managed to get a chance to go back to my old hometown in Ipoh and flip through my old belongings, I found this.” She then proceeded to hand the box to me. I hesitated. She did not specify yet whether it just to let me admire it, or whether she planned to give it to me. Look! A streaky basic 6-nib calligraphy set of Osmiroid! And a complimentary bottle of solidified ink from Stabilo! I thought it was meant to be a late April Fool’s joke or something because I would never expect someone to give a gem like this to me. After all, April Fool’s this year fell on a Sunday, a day that colleagues don’t usually meet (at least not in my company), so it was a ruined chance to play a potential joke on someone, which should be recuperated the following day. It didn’t help that the box handed to me was torn, tattered, with all 6 nibs coated with streaks of black ink all over them. Not that I’m complaining, but nothing was clear at that moment so I was still hesitant. Almost entirely coated with black ink, this one! Eventually, it seemed that she was planning to give the set to me, at which I was totally overjoyed. I wasn’t sure yet if it was still working, but the first thing I had to do was to flush out the innards with water. That was what I did. The nibs were easy to clean, but the insides were so cluttered with dried-up black ink that shaking them all in a glass bottle of water with detergent didn’t seem to remove the ink fully. I found out later on that there was also a converter available. Flushed out most of the remaining black ink and later on, it was as good as new! 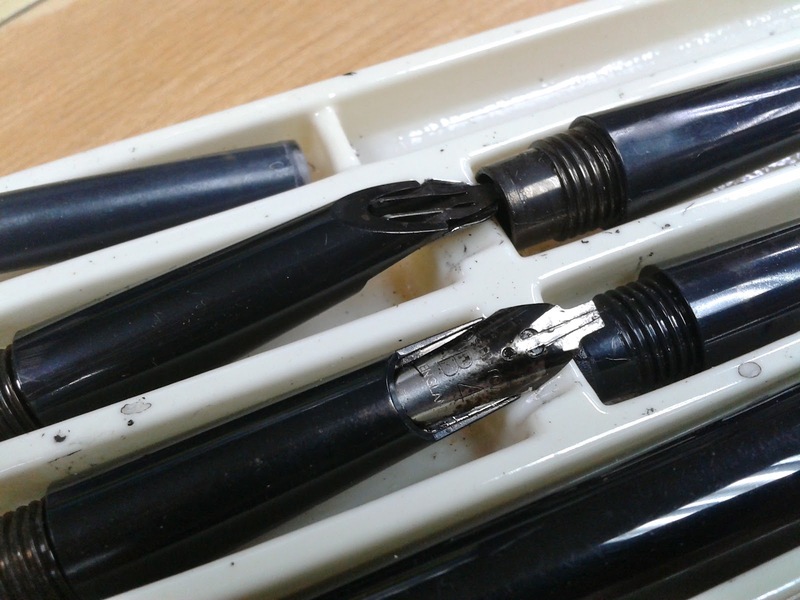 I was even surprised that the nibs also came out shiny like brand-new, and the black plastic body was not degraded after about 10 years of misuse in that previous unhealthy state! I took the box of the cleaned instruments and showed it to my colleague. I asked her whether she was sure to give it to me, since they can still be used. She told me that she had absolutely no use for it for the past 10 years, and likely no use for it in the next 10 years either. With this, I had peace of mind to keep them and I was very happy indeed! Apparently, adding some deionized water to the bottle of dried Schwann Stabilo ink helped to redissolve the solidified ink, but I’m not sure if the viscosity is right or not. The bottle, though, is still sitting on my office table and I haven’t gotten the chance to try it out yet. On the other hand, the set of 6 nibs is now sitting nicely on a notepad on my study table at home! I have randomly picked one out, screwed it onto the pen barrel, and tested it by dipping into my bottle of Sheaffer Green and writing some alphabets on a squared paper. 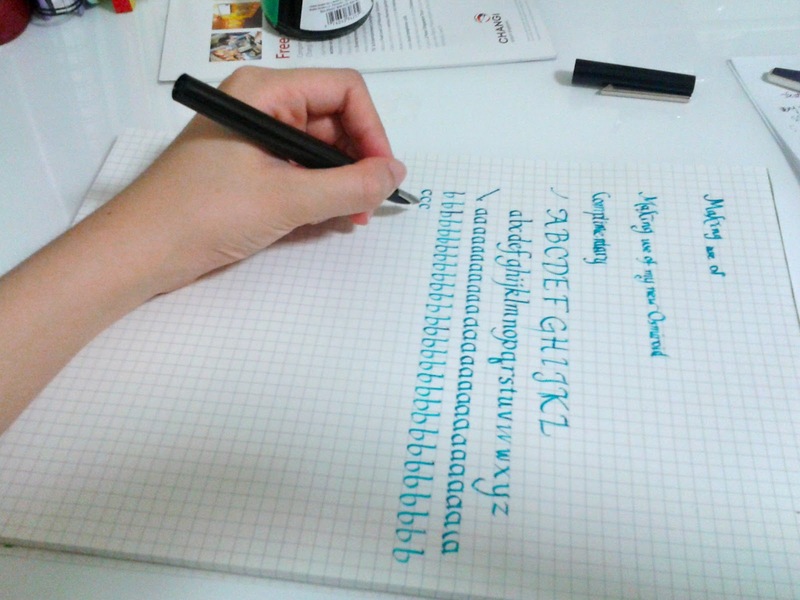 At this point I gotta mention that I have made an incredible finding two days ago: for left-handed people who are pushers or overwriters, it is advised while learning calligraphy to turn the paper 90 degrees clockwise, and write with the italic nib vertically down the page. I tried this, and indeed my nib was at the correct ~45 degrees angle from the line! Which means that while writing vertically down the page, I am able to experience it more like a right-hander since I pull the nib across the page rather than pushing it! I am saved! 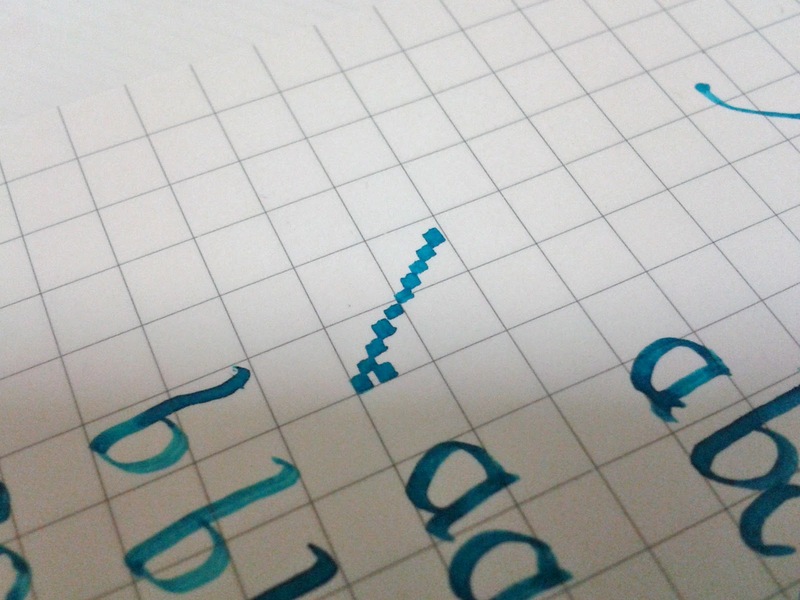 I do not need to restrict myself to using oblique dip nibs for italic calligraphy in future anymore! In fact, my paper is tilted about 110 degrees, it seems! This however poses a problem: I have not learnt very well how to read AND write at this angle of the paper. My eyes are not accustomed to reading stuff like that. So my neck tried to adapt by turning my head about 45 degrees clockwise too to help my eyes see better. Which means at the end of a period of writing, I will develop neckaches and backaches! This angle of writing is something that I need to train myself on. I am targeting to write a couple of lines a day to practice. Not too bad, huh? For a beginner writing at such an unhealthy angle! Not very accurate, but well, you get my point. 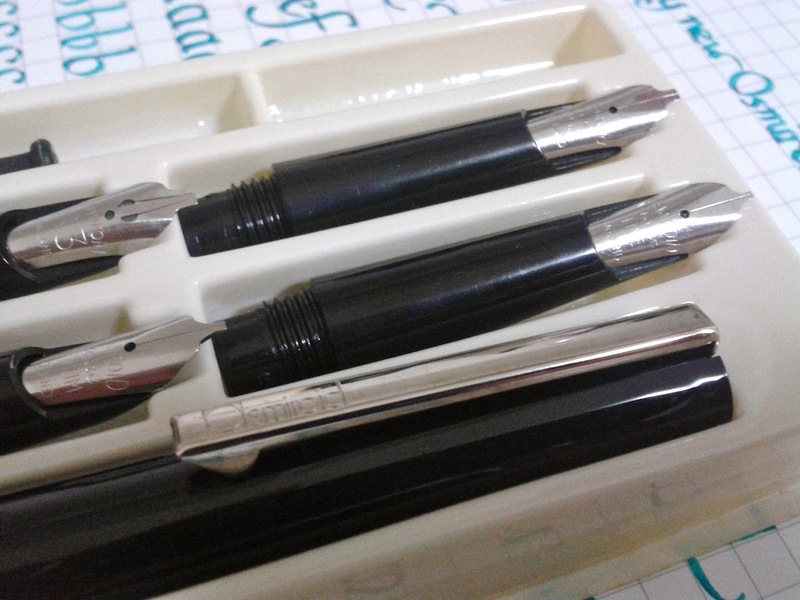 As mentioned, there are 6 kinds of nibs in this calligraphy set. In order of size, they say the following description on the nibs themselves: 1) Italic Fine, 2) Italic Medium, 3) Italic Broad, 4) B2, 5) B3, 6) B4. I guess the B-number refers to the extent of broadness of the nib (B2 = double broad, etc). I randomly picked out one of the nibs that looked a good size to me, and found that i was the Italic Broad. Coincidentally, it makes exactly 5 steps per square of my squared paper, which means it’s the perfect size of writing italic calligraphy on this paper, without me having to draw guidelines to write neatly! More experimentation coming up especially on this new writing angle for me. 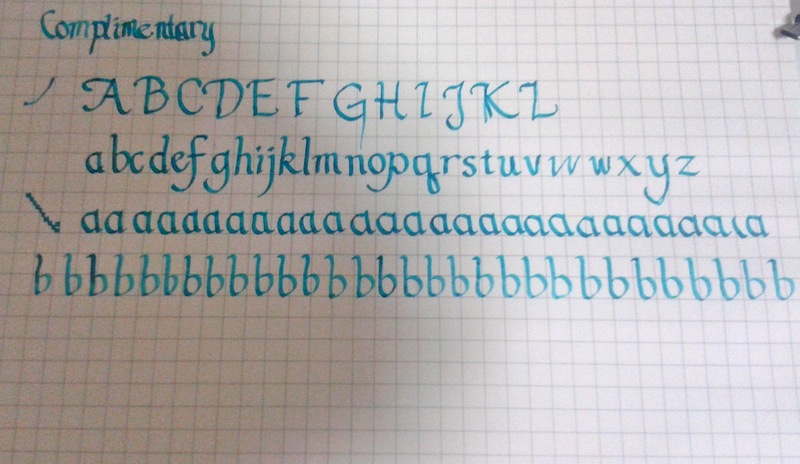 Gotta train up my italic calligraphy and I’m hoping to be able to post some decent-looking exercises here soon! Fountain pens are the most customizable writing instruments on the market. fantastic! I just got a set too but NO INK! May I know does any fountain pen ink fit this? Yep all the fountain pen inks fit! A few months ago I started a course calligraphy in Holland. I usely write with the socalled Manuscript pens, but I was so lucky to buy a set of Schaeffer pens and also 1 Osmiroid B4. And because I like the latter very much, I`ve tried to find more. Unfortunately the Osmiroid has stopped, so I wonder where and how I can get other nibs and pens. It will not be easy from Holland to place an order. Maybe someone can give me advice? Hey, Gerard. I hope your class is going well. I bought my first Osmiroid about 40 years ago, when you could find them in art stores. 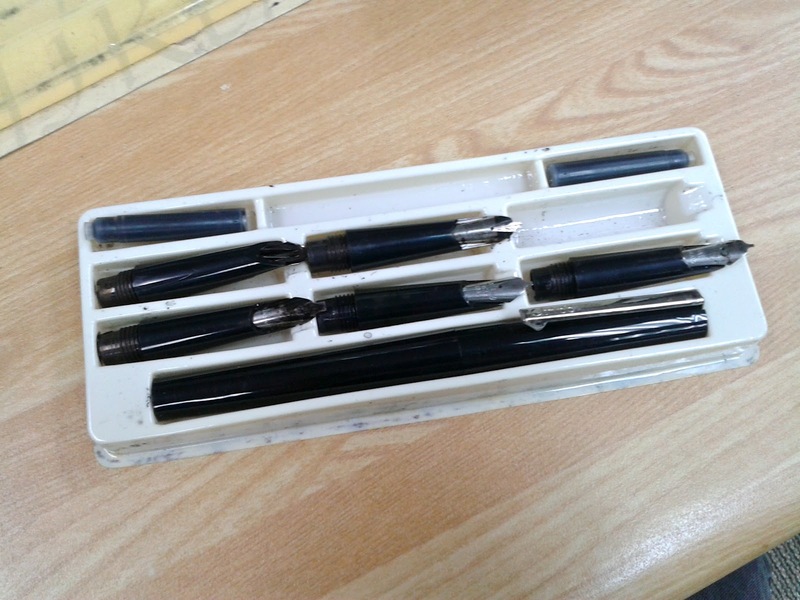 I bought a left-handed calligraphy set, similar to the one above. Through the years I’ve added to my collection and now have two 65s, two 75s, and three or four of the “new style” pens (like the ones above). I mostly get them from eBay. There are always quite a few of them from England, since they were made there and, from what I read online, were the standard school pen (like Sheaffers were here in the United States). The good thing about the pens in England is that they come in different colors, which are harder to find here. Osmiroids don’t have a great reputation with many pen lovers, but for me, they have always worked well. I also have the Manuscript, Platignum, and Sheaffer calligraphy pens, but I always go back to the Osmiroid. set and always wanted to buy one as I see them show up now and then. was – almost shellac-y (very much like India ink). There are so many better inks now – enjoy your Osmiroid – I like the color you used! I just stumbled upon your page and noticed that the nibs you got are straight even though you are left handed. Osmiroid also produced special obliquely cut nibs for lefthanders. As I am right handed and have some spare lefthanded Osmiroid nibs I would be happy to trade with you. Please drop me an email at dov.grobgeld@gmail.com if you are interested. Hi Dov, thanks for the offer, I have actually gotten my left-handed set already!